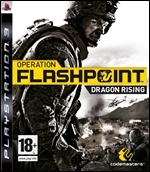 Many PC gamers swear by (and most definitely at) the Operation Flashpoint name. This harsh, tactical first-person-shooter is also making a full appearance on consoles too for a change. It’s comparable in nature with the excellent Brothers in Arms: Hell’s Highway, but based in the very near future. Dragon Rising is a much fiercer beast than BIA though with its claws severely dug into the realism side of things. So that means one shot could be it for you and you won’t even know what direction it came from. You play the American soldiers invading / liberating the small Pacific island of Skira from the Chinese PLA. Yes there’s oil involved. It’s a massive island with over 220 square km. 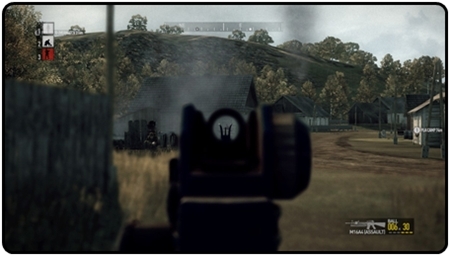 If you played Battlefield: Bad Company, the huge size of the open levels are similar in scope. As the leader of a team of four you undertake missions such as blowing up anti-air guns, radars, and taking/defending camps/villages/buildings. There are flagged markers on your display acting as a path to follow, but not as checkpoints if you snuff it. The squad command controls are activated by holding R1 and selecting from a radial menu with multiple branches that probably should have been put in fewer sub-sections to avoid fumbling around as much under fire. Controls for yourself are easy to grasp though. It’s worth taking ten minutes on a quiet bit of land to get accustomed to the squad controls (the beach on level two is nice). Movement options include formations such as lines, columns, v shapes, wedges, or tactics such as flanking. They even have the smarts to take a wide berth when flanking so they’re not spotted. Shame they’re terrible shots though. They can also be told to hold fire, fire at will or fire on your lead; you’ll have to keep reminding them though. You can tell them to assault (run straight over guns blazing), or suppress while you try and sneak around or cower behind a wall trying to form a plan, listening to their screams for help. These commands get them to act as one. You can ask individual soldiers to move or fire but it’s much too fiddly and the PLA will tear you all to shreds if you hesitate. The medic is the only one you’ll really strive to keep alive, as he can heal any wounds that haven’t instantly killed you. Bizarrely though when you tell him to heal a team mate they run away from him! If it all gets a bit much though you can call in one of many air or artillery strike options, you don’t get many though so use them wisely. Or you can take the action online and replace your AI team with real people who hopefully won’t wonder past your sniper sights or run away from the medic. There are a few slow animations that add to the panic, such as the unstoppable reload. When you want to sprint to cover because of a sudden burst of enemy fire you don’t want to have to wait till you’ve finished reloading. The time it takes to get up and move from the prone position is way longer than any soldier would ever move to seek cover too. The line compass at the top of the screen indicates enemy positions, but doesn’t tell you how close they are which can be a nightmare when it says you’re surrounded. Fortunately you can check a map which gives a better location on them so you can see who is storming towards you and who is probably having a cig break in the woods half a mile away. 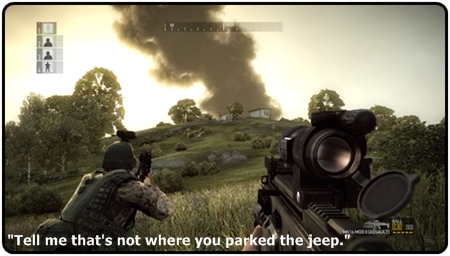 Naturally the map runs in real-time meaning you have even less time to get your act together. You’re going to die a lot in this game. That’s not the annoying part though; it’s the amount of empty, eventless land you’ll have to slog across again to get back to the area where you died. Or it’s the waiting. The level where you have to defend the barracks itself isn’t that hard, but if you do die, you have to wait two minutes on restarting before enemies reach shooting distance again. Shooting at long range is the most effective way of progressing. The second mission is a standout one with the assault taking place before dawn with lots of chances for night vision sniper shots, but with daylight gradually breaking over time making this more difficult. The sniper rifle is devastating against an oncoming wave of soldiers as a decent shot to the chest will send them tearing down as their sprinting momentum collides with the shot. Occasionally you get some bugs in the shooting, especially with windows. For example, sneaking up on a soldier at a window and shooting him in the face from five yards resulted in him stumbling back a little like a mosquito had surprised him. There are vehicles on offer, but you might as well be in an ice-cream van with the chimes turned up to 11. It’s much safer on foot and easier to suddenly take cover if needed. You might be tempted, but sneaking around on foot is half the fun, in a masochistic kind of way. Caution is key to survival. Crossing open ground should be avoided whenever possible even though it is tempting as a shortcut. The way you can approach your objectives is refreshing as you don’t have to take notice of the recommended path markers and just make a beeline straight to it. This could be even more dangerous, but sometimes you’ll get lucky. The markers adapt if you skip them too so you can go to the nearest one if you change your mind along the way. If you have a patient attitude, Dragon Rising offers a decent length and the tensest FPS experience going. It provides a decent alternative to the standard fast paced shooters out there and won’t just roll over for you even on the easier settings. Hell, you could try the hardest setting with absolutely no onscreen displays. Or you could just go and cry in a ditch for real.